After a year without giving out a “Movie Star of the Month” award I thought it was time to resurrect old award. I’m not sure if at this time if it will again become a regular feature or if it is a one-off for this month. So what made me bring it back? It wasn’t one of the fantastic performances I have seen this month: Meryl Streep, Jim Broadbent, Michael Fassbender and Carey Mulligan, great performances from great actors are to be expected but great performances from none actors is always a pleasant surprise. A little later than usual, 2011’s first movie star of the month. There are a lot of contenders this month: Colin Firth who will probably win a much deserved Oscar for The King’s Speech; James Franco’s portrayal of Aron Ralston in 127 Hours is Firth’s greatest challenger for the Oscar and also a contender here; Vera Farmiga is quickly becoming one of my favourite actresses, her performance in Henry’s Crime certainly helps her cause; Michelle Williams is as brilliant as ever in Blue Valentine; Her co-star Ryan Gosling is equally as good; The Mechanic proves that Jason Statham is every inch a movie star, he has forged an impressive career despite limited acting ability. I gave Black Swan movie of the month a couple of days ago it‘s now a clean sweep with Natalie Portman been awarded movie star of the month. I somehow think it she will be winning a lot more awards in the next few weeks. For the first time I have decided to split my movie star of the month award, I was already considering doing this for Scoot McNairy and Whitney Able for their great performances in Monsters. Then the last movie I saw in December, Love and Other Drugs changed my mind. Although the movie was only average suffering from being formulaic and clichéd (and poorly marketed) it was largely enjoyable mainly because of its stars Jake Gyllenhaal, Anne Hathaway. 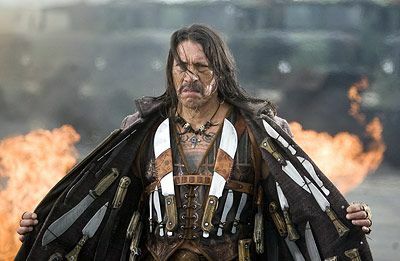 At the age of 66 and after 25 years in the movie business Danny Trejo got his first starring role in the movie Machete. He will never be the best actor or the biggest movie star in the world but he is certainly one of the most recognisable, and who else could have played Machete. Easy A narrowly missed out on my October movie of the month but its star Emma Stone is the runaway winner of the Movie Star of the Month Award. She first came to my attention last year in Zombieland (I have since seen her in Superbad). She also appeared in the short lived TV show Drive that I have heard good things about but have not seen as it hasn’t made it over here. Know for her trademark red hair, in a Hollywood overrun with fake blondes she is actually a natural blonde, she changed it for Superbad and has stuck with it ever since. It has been rumoured that she has been cast as Gwen Stacy in the Spider-Man reboot, this suggests a return to he natural hair colour. Other future projects include a movie based on the hip 80’s TV show 21 Jump Street (Johnny Depp’s big break), that could be interesting. Whatever else she comes up with next should be worth a look, I just hope she doesn’t got the same way as the star of the last great high school movie, Lindsay Lohan! It would be very easy to pick the best performance of the month that also happens to be from the best movie of the month, i.e. Jennifer Lawrence in Winter’s Bone. But that would be too easy! There has been a certain backlash against Kristen Stewart since she took on the role of Bella Swan in the Twilight movies, I however have always been impressed with her as an actress and put her shortcomings in the glittery vampires as problems with the character not the actress. She perfectly captures the charter of Joan Jett both in attitude and emotion. So for another impressive performance from an actress who doesn’t get the credit she deserves, Kristen Stewart is my Movie Star of the Month. 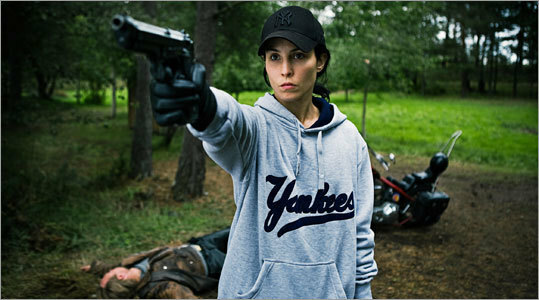 Whilst The Girl Who Played With Fire isn’t as Good as The Girl With The Dragon Tattoo its star Noomi Rapace is just as good as she was in the first movie. 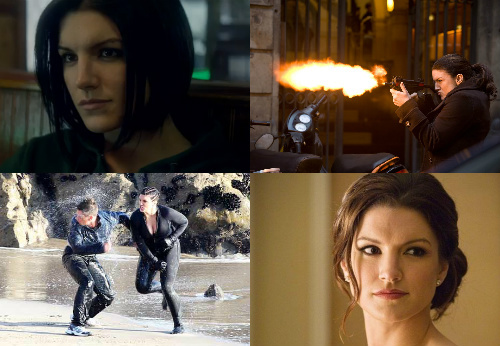 That is Why she is my Movie Star on the Month. The question everyone is asking is how will Rooney Mara compare as Lisbeth Salander in the American version next year?